Russia-backed militants violated the ceasefire five times in eastern Ukraine yesterday. The enemy used Minsk-proscribed 120-mm and 82-mm mortars having fired a total of 65 mortar rounds, reported Ukrainian Ministry of Defense spokesman on ATO Colonel Dmytro Hutsulyak at a press briefing at Ukraine Crisis Media Center. Four of the five ceasefire violations committed by Russian proxies took place in Donetsk sector. In Kamianka area, they fired ten 120-mm mortar rounds at Ukrainian positions. “Moreover, militants fired nine rounds of the same caliber near Novotroitske at about 18:00,” added the spokesman. One more mortar attack took place near Shakhta Butovka at 19:30, where militants fired forty-six 82-mm rounds. “The shelling continued for about 30 minutes and was supported with grenade launchers. However, Ukrainian servicemen did not return fire,” elaborated Col. Hutsulyak. Moreover, militants used grenade launchers against Ukrainian positions near Vodiane. The attack started at 9:00 and continued for almost 40 minutes. In Luhansk sector, militants violated the ceasefire once. “They opened small arms fire against Ukrainian positions in Zaitseve area. The incident took place at about 03:30. Our servicemen returned fire using small arms,” noted Col. Hutsulyak. 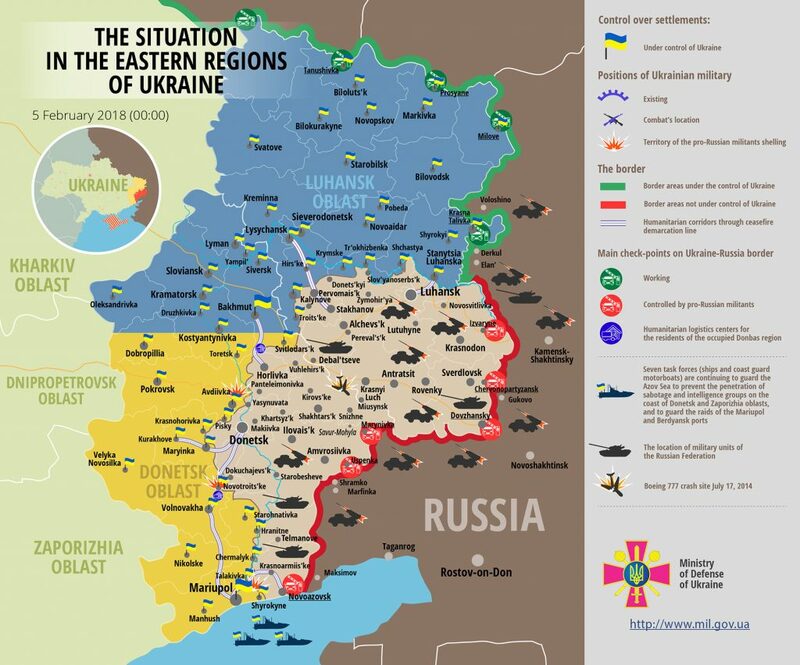 Unfortunately, three Ukrainian troops were wounded in action yesterday. Report on the military developments as of February 4 is available here. Interactive data on the shelling: chronology shelling chart and the interactive map.